The eoriginal estone emeasures ethree efeet ehigh eby eone efoot ewide, eand eit econtains e87 elines eof eHebrew etext. eHowever, ethe everses eare ewritten eon ethe estone erather ethan ebeing eengraved, eand eit eis epresently ebeing edated eto ethe eend eof ethe efirst ecentury eB.C. eor ea elittle elater. eThe eorigin eof ethe estone eis eunknown, ebut eit eis ethought eto ehave ecome efrom ethe eTransjordan eregion. eThe einscription eis ean eapocalyptic emessage ethat eis erather etypical eof eJewish ewritings, esuch eas ethose efound ein ethe eDead eSea eScrolls. eIt eis ewritten ein efirst eperson eand ethe eauthor eclaims eto ebe eGabriel e(line e77). eMuch eof ethe emessage eis emissing eand emany eparts eof eit eare eextremely edifficult eto edecipher. eUnfortunately, ethis eis eespecially ethe ecase eat ea efew ekey ejunctures eof ethe ereading. A emajor etranslation eby eJewish escholars eAda eYardeni eand eBinyamin eElizur eproposes ethat ein eline e80, eGabriel eis esaying esomething eabout ethree edays, ebut ethat ethe eremainder eof ethe ewords ethere eare etoo eobscure eto edecipher. eThe eimmediate econtext einvolves ebloodshed, eand eone ecalled e"the ePrince eof ePrinces." eThe ebackground efor ethe ediscussion eseems eto ebe etaken efrom eseveral eOld eTestament ebooks, erelying echiefly eon ethe ebook eof eDaniel e(Yardini, eBAR, eJan/Feb, e2008). To edate, ethe echief epoint ebeen emade eby escholars esuch eas eIsrael eKnohl eis ethat eperhaps eshortly ebefore ethe etime eof eJesus ethere ewas emore ethan eone ecompeting enotion eof ethe ecoming eMessiah ein eJudaism. eInstead eof eonly ea eDavidic eMessiah ewho ewould econquer ethe enation's eenemies, ethere eis ealso ea econcept eof ea esuffering eMessiah. eIf eKnohl’s etranslation eof eline e80 eof e"Gabriel's eVision" eis eupheld eby escholars, ethen eit emay ealso ehave ebeen ebelieved eby esome ethat ethe esuffering eMessiah ewould erise efrom ethe edead ein ethree edays. This einterpretation ewould eprobably ebother every efew eChristians. eAfter eall, ebelievers ehave elong eargued ethat ea edying eand erising eMessiah ecan ebe efound ein evarious eOld eTestament etexts, eso ewhy ecouldn't esome epre-Christian eJews ehave etalked elike ethis ejust ea efew eyears ebefore eJesus? But esome eevangelical eapologists ehave eespoused ethe ecommon eJewish escholarly eview ewhich eemphasizes ethat eJudaism eat ethe etime eof eJesus ehad eno econcept eof ea erising eMessiah. eRather, ethe eNew eTestament enotion eis ethat eJesus ewas ethe eonly eone eto ehave erisen efrom ethe edead ein ea eresurrection ebody ebefore ethe eend eof etime. eThus, ethese eapologists ehave easked ehow ewe ewould eaccount efor eJesus’ eunique eresurrection ethat eoccurred eout eof ethe enormal etime esequence. Actually, eit edoes enot eappear ethat emuch eis eat estake ehere, eat eleast eso efar. eIf eKnohl’s etranslation eis eupheld, eperhaps eevangelicals ewill ehave eto erevise eor esomehow eadd ea ecaveat eto etheir eprevious enotion ethat eJews ehad eno eplace efor ethe eresurrection eof ean eindividual ebefore ethe eend eof etime. ePerhaps ethey ewould esimply eadd ethat ethere emay ebe ea eseemingly eminority eJewish eview ethat edisputes ethis. Personally, eI ethink ethat ethe eoriginal epoint esometimes emade eby eChristian eapologists ehere eis ea erelatively eminor eargument. eIn emy edozens eof epublications eon ethe eresurrection, eI erarely emention eit eat eall, eand edo enot eemphasize eit eas ea estrong eargument efor ethe ehistoricity eof ethe eresurrection eof eJesus. Before esolid econclusions ecan ebe edrawn, ethe eprecise ewording eof ethe einscription emust ebe ehashed eout eby escholars, eespecially ewith eregard eto ethe emost eimportant elines, esuch eas e80-81. eKnohl eis ea egood escholar eand eI ewant eto ebe eclear ethat ehis etranslation emay eactually eturn eout eto ebe ethe ebest eone, eand ethat’s eabsolutely efine. eNothing eturns eon ethis epoint. eBut ethe efact eremains ethat ethe ebest ediscussion ecan eonly eproceed ewhen ewe eknow ethe etext ewith ewhich ewe eare edealing eas eexactly eas epossible. eAfter eall, eas eanother eJewish escholar, eMoshe eBar-Asher, estates, e"in ecrucial eplaces eof ethe etext ethere eis ea elack eof etext. e. e. e. ein etwo eto ethree ecrucial elines eof etext ethere eare ea elot eof emissing ewords" e(as equoted ein eEthan eBronner, e"Ancient eTablet eIgnites eDebate eon eMessiah eand eResurrection," eNew eYork eTimes, eJuly e6, e2008). eAnd ethe echief eissue ehere eamong ethe ewords ethat emust ebe edetermined eare enothing eless ethan ethe eportion eabout erising efrom ethe edead. eWhat eexactly ewas eGabriel esaying eabout ethe ethree edays? As eKnohl estates, ehis eview eof e"Gabriel's eVision" econfirms ethe ethesis eof ehis eearlier ebook, eThe eMessiah ebefore eJesus e(University eof eCalifornia ePress, e2000). eAgain, ehis eopinion eis ethat ebesides ea econcept eof ea eDavidic eMessiah, esome eJews ealso ebelieved ein ea eslain eMessiah, ewho ewas ethe eson eof eJoseph e(Ephraim). eAlthough ehe emay ewell ebe eright, eother escholars eneed eto eweigh ein eon ethe eissue, ein eorder eto econfirm ewhether eor enot ethis eparticular einscription esupports eKnohl’s ethesis. eAfter eall, ethis eis enot ea ecommon eview ein estudies eof eJudaism. As ewe ejust eexplained eabove, ethe ethesis ethat eJews ehad eabsolutely eno eplace efor ea eresurrected eMessiah, eespecially ebefore ethe eday eof eresurrection, emight ehave eto ebe eamended. Some epopular ecommentators ehave ebarely eraised ethe equestion eof ewhether eChristians emay eactually ehave ecopied efrom epre-Christian eJudaism ethe eidea eof ea eresurrection eafter ethree edays. eOn ethis einterpretation, eChristians emore eor eless einvented ethe enotion efrom eprevious eJewish eexpectations. eTo emy eknowledge, eno ecritical escholars ehave eso efar etaken ethis eapproach. eEven eJames eTabor ecomments ethat ethe e“Suffering eMessiah” eideas e“were enot ecreations eof ethe eChristian ecommunities eafter eJesus’ edeath. e. e. e.” e(Tabor eblog, eJuly e5, e2008). eRather, eTabor’s ecomments esupport ethe econcept ethat ea epopular eview ein eearly eChristianity econtinued ethe etradition eof esome epre-Christian eJews, ewho edid eenvision ea esuffering eMessiah e(Tabor eblog, eJuly e7, e2008). Even eif ea esuffering eand edying eMessiah eis ea eminority eview ein ethe eJewish ethought eof ethe efirst ecentury eB.C., ethe eidea ethat ethere ewere etwo ekinds eof emessianic efigures eis ea every enice ecomplement eto ecurrent eevangelical ethought. eSome emight epostulate ethat eeven elosing ethe eabsolute euniqueness eof ethe etiming easpect eof eJesus—that eJews enever ethought eof eanyone ebeing eraised efrom ethe edead ebefore ethe eend eof ethe eworld--is ea efair etrade efor erestoring ethe econcept eof ea edouble emessianic ehope, ewhich eplays einto eso emuch eof eevangelical escholarship, emost enotably ein ethe etwo ecomings eof eJesus. The eclose econnection ebetween e"Gabriel's eVision" eand eOld eTestament ewritings, eespecially ethe ebook eof eDaniel, efurther estrengthens ethe epropensity eof esome eevangelicals efor efinding emessianic eprophecies eor etypes ein epre-Christian, eJewish ethought. eFor eif ethe enotion eof ea esuffering, edying, eand eresurrected eMessiah eis eestablished efrom eOld eTestament etimes, ethis ewill esimply efeed ethe econnection ebetween ethe eTestaments, eincluding epointers eto eJesus eas ethe eChrist. eSo eit emust ebe enoted ecarefully ethat e"Gabriel's eVision" epresents every elittle edisruption eto ecurrent eevangelical ethought. One eof ethe estrongest ecorollaries eproceeding equite enaturally efrom e"Gabriel's eVision" eis ethat eJesus' epredictions eof ehis edeath eand eresurrection e(such eas ethose efound ein eMark e8:31; e9:31; e10:33-34; e14:27-28) ewould eprobably eseem equite enatural eto ehis elisteners ewho ewere efamiliar ewith ethis eor esimilar eJewish etraditions. eTherefore eit emay ebe eno esurprise eto esee ethat ecritical escholars esuch eas eKnohl e(cited ein eBronner) eand eTabor e(The eJesus eDynasty e[Simon eand eSchuster, e2006], ep. e181; eTabor eblogs, eJuly e5 eand e7, e2008) eallow ethat eJesus eand ethe eearly echurch efavored ethe esuffering eMessiah eview. eIf eJesus edid epredict eand ehave eknowledge eof ethese eevents, ethat emust ebe eexplained, eas ewell. As ecritical escholars ealso eacknowledge ereadily, eearly eChristians edid enot einvent ethe eresurrection eof eJesus efor eany ereason, ebut eleast eof eall ebecause eof eteachings elike ethose ein e"Gabriel's eVision." eRather, ethe eearliest etestimony eis eclear: ethe echief eimpetus efor ethe eChristian eproclamation ewas ethe eappearances eof ethe erisen eJesus eafter ehis edeath, eas etaught ein ea etext ethat ealmost eassuredly ecomes efrom ethe e30s eA.D. e(1 eCor. e15:ff.). eMost escholars ealso ethink ethat eJesus’ etomb ewas eempty, eand ethis erequires ea ephysical eexplanation. eIn eother ewords, ethe eChristian eteaching eis ebased eon ewhat ewere eperceived eto ebe ereal eevents; eJewish eexpectations ealone ewould enot ehave edone ethe ejob. eThat eJesus’ eearly edisciples etruly ebelieved ethat ethey ehad eseen ethe erisen eJesus eis evirtually enever edisputed ein ethe escholarly ecommunity. In emy eopinion, ethe erecent etranslation eof e"Gabriel's eVision" eis eactually emore epositive ethan enot. eI ethink ethere eis ea every eminimal eamount eof echallenge eto eChristian ebeliefs. eOn ethe eother ehand, ewhat eis egiven eback eis egreater estill. eBeyond ethe earea eof eapologetics, ethe enew einformation eon ethe ediversity ewithin eJewish emessianism eis eitself eexciting. eAt eany erate, ethere eshould ebe every elittle ehere eto edisturb eChristians, eor eprobably eanybody eelse, efor ethat ematter. 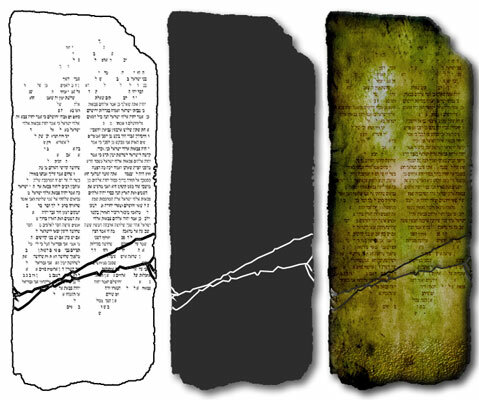 Illustration: The images at right indicate, from left to right, the extent of legible Hebrew text, a proportionally accurate outline with crack placement, and an artist's conception of the actual stone respectively. Note, the letters are not engraved.